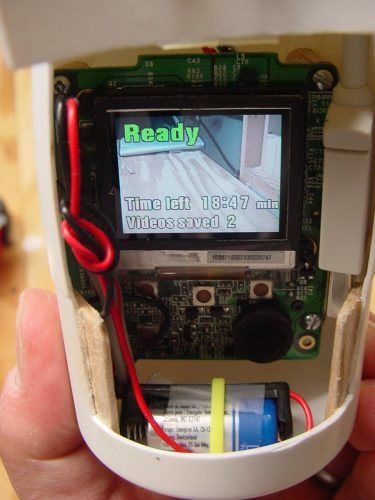 What happens when you mix a rocket with a disposable camcorder? I got the idea to do this from a Make Magazine while on a business trip. 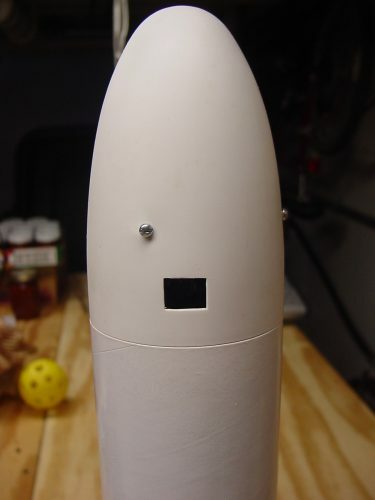 The project mixed my older childhood hobby of model rocketry with a more recent one that involved experimenting with various inexpensive but high value “hacks” such as a camera. The rocket I used was the Canadian Arrow from Estes which was recommended by the author of the article, Rocket-Launched Camcorder. 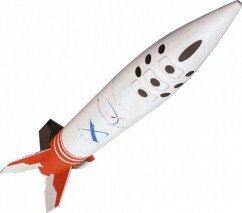 This larger rocket is needed to accommodate the fairly small CVS camcorder within the nosecone. 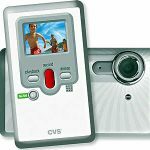 The camcorder records full motion MPEG-4 video for 20 minutes and fits in your pocket. It has basic features to record, playback and erase videos. 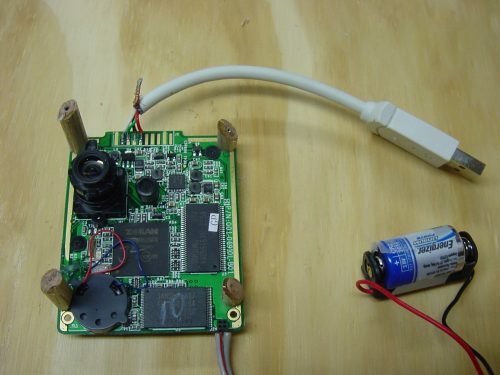 The interesting thing is that this camera can be disassembled easily and put onto just about anything! You can read the full article on how to do this, but here’s the short of it. The camera is dissembled from its original case. 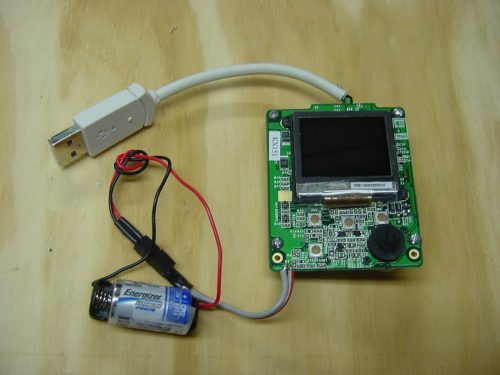 A USB connector and smaller battery are soldered to the circuit board. This reduces the weight and size significantly. Several modifications to the nosecone must be made. Most importantly, you have to make a hatch to place the camcorder into it. I cut mine out using a Dremel tool and then added a nylon hinge (the type used for control surfaces on model airplanes) near the top. The camera is mounted using 4 standoffs that are bevel cut to match the inside curve of the nosecone (as close as possible). I used 1/4 inch oak dowels and added very small wood screws from the outside to hold it together. The original article suggested using epoxy and nylon standoffs with machine screws. I tried that, but had little success. This method doesn’t look as nice, but it is probably stronger. A hole must be cut for the camera lens to peep through. You can mount an optional 45-degree angled mirror outside the nosecone to provide a view downward instead of towards the horizon. The battery must also be secured to the nosecone. A nylon tie is useful for this. I also strongly recommend that the positive terminal of the battery be electrically tied together with the battery holder. My first attempt to fly the rocket resulted in a bad video recording due to the battery momentarily being disconnected when the rocket bounced on landing. Don’t skip this step! 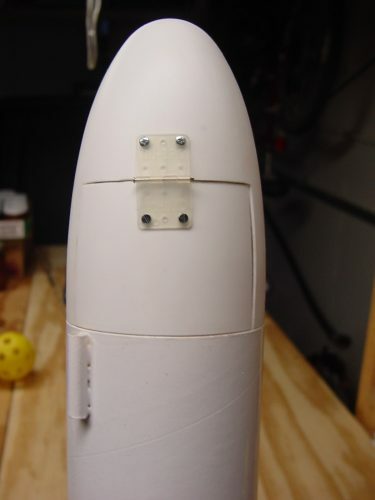 Below you can see the completed nosecone modifications with the camera peep hole and hinged hatch side. 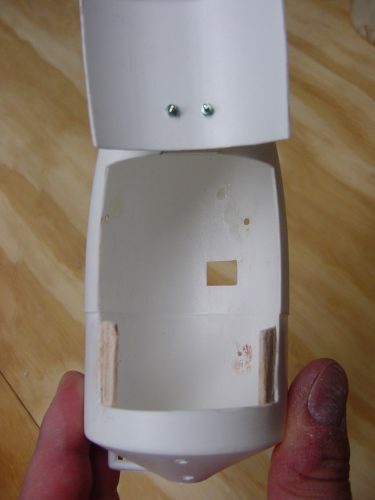 One note about the nosecone – I chose to purchase a stock 2.5 inch nosecone from the hobby store to hack up rather then use the original one from the kit. The one that comes as part of the kit is somewhat unique and doesn’t appear to be available separately. This way, I can untie the camera fitted nosecone from the rocket and use it on others while keeping the original rocket kit together. 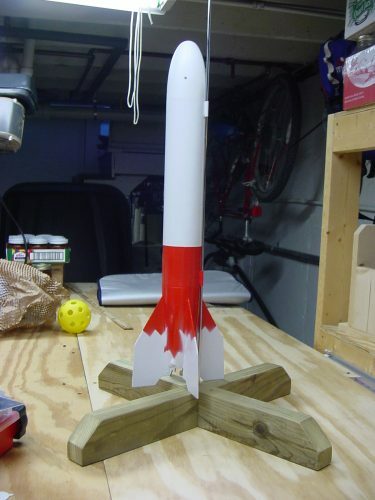 The completed rocket is assembled and painted the suggested color of red which will make spotting easy. 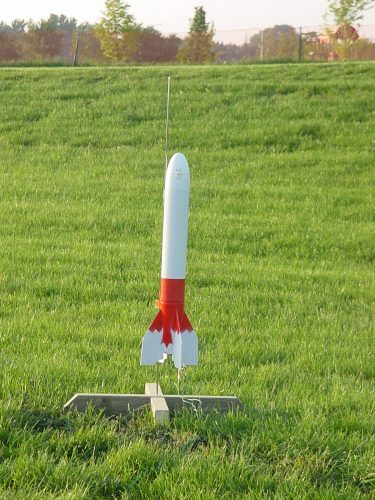 This larger rocket requires a heavier launch rod (5mm) which I bought from the store. The homemade launch stand was made from treated 2×4’s. I used a simple half-lap type joint to tie the two pieces together and then drilled 3 holes at 0, 10 and 20 degrees to receive the launch rod. The flight was successful even in moderate winds. The parachute was damaged upon ejection and one of the shrouds was ripped away. For this reason, the rocket fell much faster and less gracefully then it normally would have. I would recommend upgrading to a high quality parachute if you’re going to go through all this trouble building this modified rocket. I’ve seen them at the hobby store, so they should be readily available. There’s also an interesting mod you can do to the shock cord attachment to ensure that the nosecone stays upright throughout decent. This would be a good idea for maximizing the usable video recorded. For more information on this project and countless other fun and educational projects for the maker at heart, check out volume 7 of “Make”.